The flu is a contagious respiratory illness caused by influenza viruses that infect the nose, throat, and lungs. While many people use the term “stomach flu” to describe an illness, the influenza-type flu that you can be vaccinated against is a respiratory disease and not a stomach or intestinal disease. Symptoms of the flu include fever, cough, sore throat, runny or stuffy nose, body aches, headache, chills, and extreme tiredness. What should I know for the 2016/2017 flu season? Only injectable flu vaccines (flu shots) are recommended for use this season. There will be some new vaccines on the market this season, including an adjuvanted vaccine for people 65 and older. Learn more about what’s new for the 2016-17 flu season by visiting the CDC flu information center. 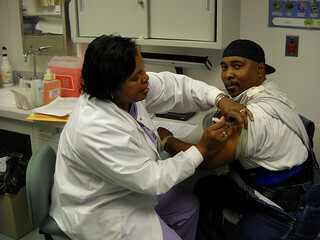 Encourage your caregivers and those you live with or see often to get vaccinated for the flu to reduce your potential to encounter the flu virus. For more information about influenza or the flu vaccine, talk to your doctor or nurse, visithttp://www.cdc.gov/flu or call CDC at 1-800-CDC-INFO.